Teresa Hubbard and Alexander Birchler’s expansive practice interweaves hybrid forms of storytelling and invites suggestive, open-ended reflections on place, history, and memory. In their three-channel film installation Giant (2014), Hubbard / Birchler present a decaying movie set just outside Marfa, Texas, left behind after the 1956 filming of Giant, starring Elizabeth Taylor, Rock Hudson, and James Dean. Weaving together the cinematic past and present, the film captures scenes from a Warner Bros. office in 1955 and the skeletal remains of the movie set today as seasons change, day turns to night, and parts of the structure swing and fall off. Giant is the third part of a trilogy of films exploring the social character of the cinematic experience, with particular respect to film’s relationship to place and the kinds of traces movies leave behind. 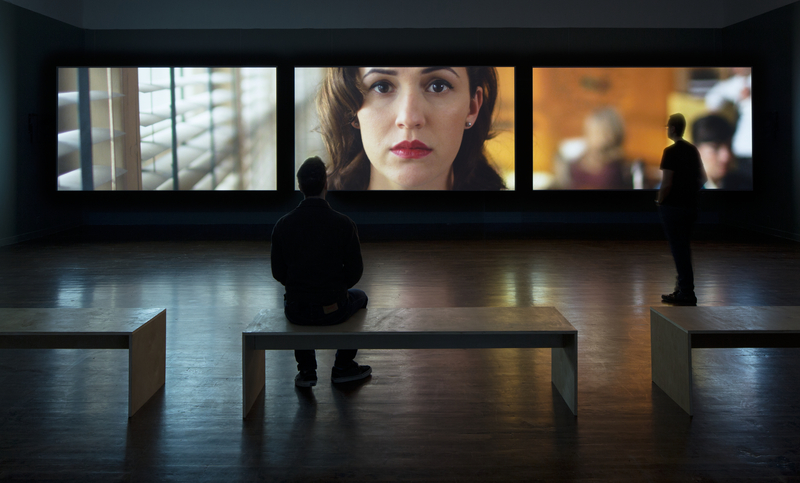 This work was first seen as part of Sound Speed Marker (2014–15), an international touring exhibition that included film installations, sculpture, and photographs by the artists. Internationally recognized Austin- and Berlin-based artists Teresa Hubbard and Alexander Birchler have been working collaboratively in film, photography, and sculpture since 1990. Hubbard is the William and Bettye Nowlin Professor in Photography and Assistant Chair–Studio Division in the Department of Art and Art History at The University of Texas at Austin, and Birchler is an Affiliate Research Scholar at The University of Texas at Austin. Currently, Teresa Hubbard / Alexander Birchler are representing Switzerland in the Swiss Pavilion at the 57th Venice Biennale. This installation is organized by the Blanton Museum of Art. Funding is provided in part by Ellen and David Berman. On Thursday, September 7 at 6:30 p.m., in conversation with Blanton curator Veronica Roberts, Hubbard and Birchler will discuss Giant and the experience of representing Switzerland in the current Venice Biennale. The discussion will take place in the museum's auditorium, located directly across the outdoor plaza in the Smith Building.